Another item from my photograph collection is this ferrotype. Ferrotypes, more commonly referred to as tintypes, were a collodion photography process in which an emulsion was applied to a lacquered iron plate to create a positive image. Despite the more commonly known name, tin was not used as part of the substrate. 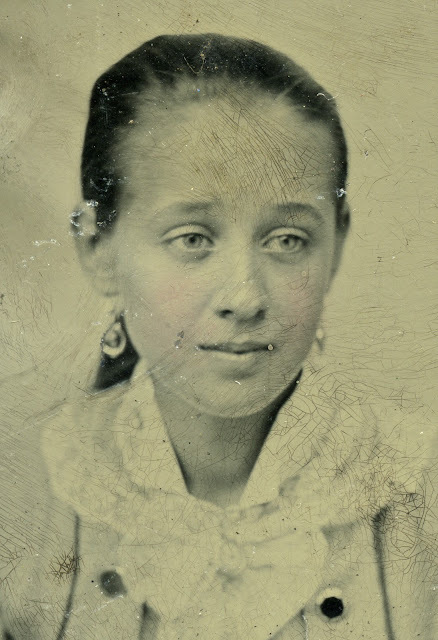 The photograph above, with a cropped detail below it, is certainly from the nineteenth century, but not being a fashion expert, I wouldn't be able to narrow down the date to anytime more specific than sometime [most likely] between 1865 to 1900. Looking at the cropped detail, we can clearly see that some blush hand tinting was applied to the subject's cheeks. 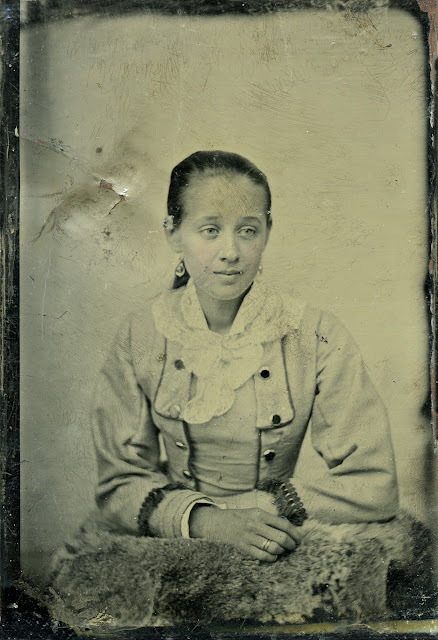 The ferrotype gained in popularity near the end of the American Civil War and started to fade from production around the turn of the twentieth century as newer photographic processes and materials started to dominate the market. In our digital age, when more photographs are taken in a day than in the entirety of the nineteenth century, we can look back at this particular process, the ferrotype, and see the beginnings of photography's democratization. For it was the ferrotype, which could be processed and handed to the sitter in a matter of minutes after being taken, that allowed the masses to sit for the camera for an affordable price.